The Secretary’s decision today took into account the MEK’s public renunciation of violence, the absence of confirmed acts of terrorism by the MEK for more than a decade, and their cooperation in the peaceful closure of Camp Ashraf, their historic paramilitary base. Yet US policy before the State Department’s delisting, and events ever since, have proven this rationale for removing MEK as an FTO to be an intentional fabrication – that MEK was and still is committed to political violence against the Iranian people, and envisions a Libya-Syrian-style conflict to likewise divide and destroy the Iranian nation. However, facts regarding the true nature of MEK is not derived from Iranian state media, or accusations made by MEK’s opponents in Tehran, but by MEK’s own US sponsors and even MEK’s senior leadership itself. The Mojahedin-e Khalq (MeK) is proscribed in the UK under the Terrorism Act 2000. It has a long history of involvement in terrorism in Iran and elsewhere and is, by its own admission, responsible for violent attacks that have resulted in many deaths. The briefing paper makes mention of “assiduous” lobbying efforts by MEK to have itself removed from terrorist lists around the globe. 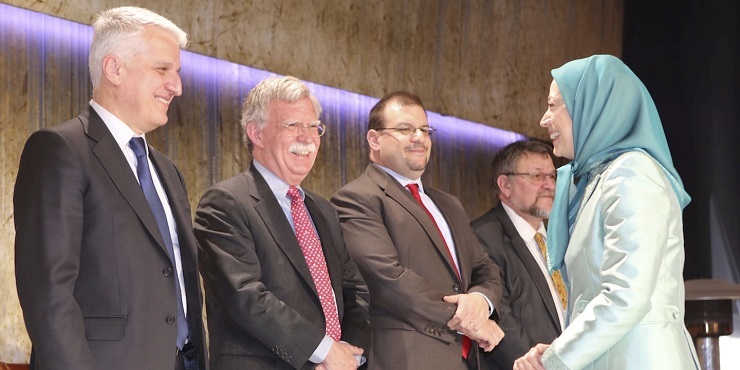 A 2012 Guardian article titled, “MEK decision: multimillion-dollar campaign led to removal from terror list,” would extensively detail the large number of prominent US politicians approached and paid by MEK as part of this lobbying effort. Yet there is more behind MEK’s delisting than mere lobbying. As early as 2009, US policymakers saw MEK as one of many minority opposition and ethnic groups that could be used by the US as part of a wider agenda toward regime change in Iran. And from 2009 onward, that is precisely what was done. It is unlikely that the MEK alone facilitated the rehabilitation of its image or exclusively sought its removal from US-European terrorist organization lists – considering the central role MEK terrorists played in US regime change plans versus Iran. While MEK propaganda insists that its inclusion on terrorist organization lists around the globe was the result of a global effort to “curry favor with Iran’s clerical regime,” it is clear that the terrorist organization earned its way onto these lists, and then lobbied and cheated its way off of them. While Iranians mourned in the wake of the Ahvaz attack, MEK was holding a rally in New York City attended by prominent US politicians including US President Donald Trump’s lawyer Rudolph Giuliani and former US National Security Adviser under the Obama administration, James Jones. During the “2018 Iran Uprising Summit” Giuliani would vow the overthrow of the Iranian government. Riots by definition entail violence. The riots taking place across Iran beginning in late 2017 and continuing sporadically since – of which Rajavi and her MEK take credit for organizing – have left dozens dead including police. One police officer was shot dead just before New Year’s, and another three were killed in late February 2018 during such riots. In the region of Ahvaz specifically, MEK social media accounts have been taking credit for and promoting ongoing unrest there. Ahvaz was more recently the scene of a terrorist attack in which gunmen targeted a parade leaving dozens dead and scores more injured. Despite its limited popularity (but perhaps because of its successful use of terrorism), the Iranian regime is exceptionally sensitive to the MEK and is vigilant in guarding against it. It was for this reason that Brookings singled them out as a potential proxy in 2009 and recommended their delisting by the US State Department so the US could provide more open support for the terrorist organization. It is clear in retrospect that the rise of the self-proclaimed “Islamic State” (ISIS), Al Qaeda, Al Nusra, and other extremist fronts in Syria were a result of this US policy. It is also clear that there are many other extremist groups the US has knowingly whitewashed politically and is covertly supporting in terrorism aimed directly at Iran itself. It is just a matter of time before the same denials and cover-ups used to depict Syrian and Libyan terrorists as “freedom fighting rebels” are reused in regards to US-backed violence aimed at Iran. Hopefully, it will not take nearly as long for the rest of the world to see through this game and condemn groups like MEK as the terrorists they always have been, and continue to be today. Also in retrospect, it is clear how US-engineered conflict and regime change has impacted the Middle Eastern region and the world as a whole – one can only imagine the further impact a successful repeat of this violence will have if visited upon Iran directly.